Guest Designer Spotlight: Deanne Burton! Today our Designer Spotlight is shining on Deanne Burton, Guest Design Team Member at SBCH for the month of January 2009. Thanks Deanne for sharing a bit of yourself with us here today and over the past month at SBCH! “I am very passionate about scrapbooking and every chance I get (which is about EVERY DAY!) I spend it creating something. My favourite time is SUMMER when I get two full months of ME time to scrap ’til I drop! Deanne turned the tables on me during the course of our interview when I asked her how she organizes her SB albums! LOL! After describing her organizational scheme, she asked if I’d like to know how many albums she had. She raced off to count and came back with the total: 44. YES: 44, 12×12″ albums of her two boys, she and her husband Todd, their pets, extended family, and even some BOMs. Friendly and effervescent, Deanne has a passion for blogging and is involved with several: Sisterhood of Scrap (SOS), “Am I a Scrap Addict?” plus a Sketch blog and a Christmas Cards Challenge blog. She told me that her favourite is SOS, the Challenge blog she co-manages with her 2 sisters, Carla Robinson and Susan Coish. She also contributes to three additional blogs! 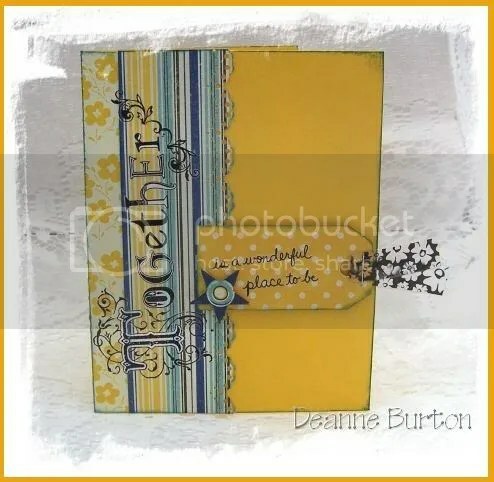 Deanne believes that scrapping is all about “sharing and being inspired and getting encouragement and praise from other scrapping sisters from everywhere in the world.” She actively practices this through the Sisterhood of Scrap blog, regularly highlighting scrappers and their creations from all over the globe. Anyone who has received feedback from Deanne in the SBCH Gallery, on the Forum or on one of the blogs she maintains knows that she is enthusiastic and genuine in her praise and encouragement of other scrappers. Asked how she makes her scrapbooking time count, Deanne unhesitatingly replied that she scraps “everything, for everyone… I do albums for my sisters, sister-in-law, mother, and mother-in-law…. It’s all good…” As far as blending scrapping with her life, she told me that she usually scraps “in the evenings or into the wee hours of the mornings on weekends or holidays.” One of her favourite pages ever is a baby layout done with the 3 Bugs in a Rug “Seeing Stars” paper collection (below). Deanne DOES have a favourite paper manufacturer. She says that “I don’t usually get caught up in the latest and greatest product, but I do like Basic Grey and will buy full collections and the buttons, ribbon, and chipboard that goes with it!” Deanne also has a huge button collection. She stores her buttons (and her brads) in big glass candy jars. Other collections include Christmas decorations: angels to adorn her tree and Gingerbread decorations for her kitchen. This month, Deanne had the chance to create with the February 2009 “Homegrown” Kit from SBCH. Two of her favourite projects were the layout and card shown here. A layout created by Deanne w/ the SBCH Feb 2009 "Homegrown" Kit: "Havin' Fun!" A self-professed “Harley Chick,” Deanne laughingly told me that although she doesn’t ride her own bike, “I thoroughly love riding with my DH!!! 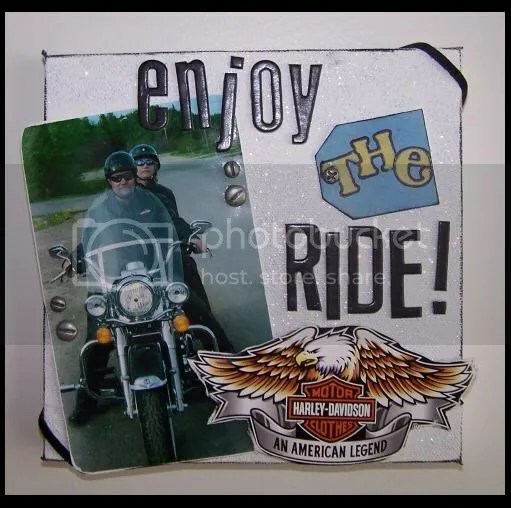 !” One of her favourite altered projects is a small canvas she created of just this topic: riding the Harley! Thanks so much for being in the spotlight this month, Deanne!! Design Team Member Spotlight, Scrapbooker's Club House News! WOW! Great to know you a bit better!! Congrats at being the guest designer and in the spotlight!! WTG! Congrats on being guest designer, Deanne! Thanks for being our Guest DT this month Deanne! You did a super job and we love having you as part of our “gang”. What a great article! So much info about you Deanne! It’s great to get to know more about you. Thanks for doing such a great job this month! Great interview, Ali! I really enjoyed getting to know you better Deanne! So nice to see such a great interview and spotlight on Deanne Burton ! Congrats on your guest design and all the wonderful contributions! !